When the call from the WRU comes, who are we to refuse? After the legendary tour to Frascati in 2017, we were delighted to have been asked once again to support the Wales rugby team on their Six Nations trip to Rome in February 2019. After a chance encounter with the British Ambassador to Italy, Jill Morris, in 2017, we were thrilled to be invited to a reception at her residence, and what an epic night it was, with members of the Welsh (and Italian) rugby federations present; followed by various appearances at the Stadio Olimpico the next day. Once in a while it’s nice to have a home fixture, and the choir was delighted to make the short journey down the road to Kew to perform at the Barn Church, Kew. As the first church in England to be built from a barn, the church has a unique place in the country’s history, and the choir was proud to have been asked to play its part in preserving this special place. Once again, a packed house was treated to our growing repertoire, with more than a passing nod to the close association between the choir and a love of the oval ball game, even if we were in “enemy territory”!! To celebrate the 60th anniversary of the Ysgol Gymraeg Llundain, the London Welsh School in West London, we were delighted to join forces with our friends in the London Welsh and Gwalia choirs to present a one-off, gala concert at the iconic Jewin Chapel. In the stunning and historic surroundings, and conducted by Pat Jones, the unique evening featured stunning solo performances by the soprano Glenys Roberts and tenor Huw Rhys Evans and the joint male voice choirs. A packed house helped create an incredible atmosphere for a night that will live long in the memory. sell-out audience on a musical journey around the world, mixing a number of crowd-pleasing Welsh favourites with a selection of repertoire-stretching new arrangements. 2018 Tour de France winner Geraint Thomas and teammate Luke Rowe back for a special reception at Sky’s headquarters, and with live coverage on both Sky News and Sports channels, it was another high-profile occasion for the choir. A slightly jaded Thomas hailed the choir’s performance as “awesome”. We broke new ground this summer with our first ever tour to the delightful island of Malta – home to a "varied, rich history and cultural heritage stretching back over 7,000 years". we also headlined major concerts at two of Malta's premier venues. A particular highlight for the 50-strong party was appearing at the fabulous St Andrew's Scots Church (a 19th-century treasure built as the first non-Catholic church in Malta) in the capital, Valletta, celebrated as the European Capital of Culture in 2018. The boys were back in town! And what a stunning night it was. The choir was thrilled to renew its long acquaintance with the Suffolk West Federation of WI and make a welcome return to the stunning setting of the Apex Theatre. Billed as The Sounds of Wales in Suffolk, the choir did include its unique arrangements of some Welsh classics, but also took the chance to unveil one or two surprise new additions to the repertoire. We were delighted to be joined on the stage by local soloist Mel Cotton in sparkling form, and the after-party was another rousing occasion. The legendary Welsh fly half Phil Bennett OBE, global superstar Rhys Meirion, his Three Welsh Tenors colleague Aled Wyn Davies, up-and-coming harpists Awen and Annest Davies in the beautiful setting of the Emlyn Hotel... what a night in Newcastle Emlyn! 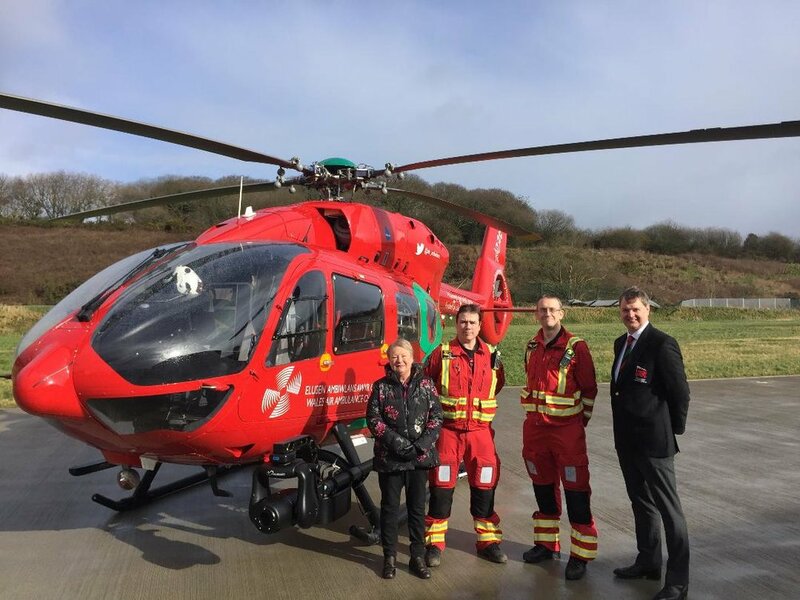 The memorable evening managed to raise almost £10.000 for the Wales Air Ambulance charity and, as well as hearing from the mercurial Bennett as guest speaker, the combined voices of Meirion and Davies provided a real treat for the sold out audience. Talks are already underway for a follow up performance and the choir can't wait!! Wales came to Surrey for what was a magical night to remember in November. In memory of David Pennar Jones, a great supporter of London Welsh who died around this time last year, the choir was honoured to have been invited to this fundraising concert in aid of Cancer Research UK, presented by QS Copley Clark. Joining us on the evening was Martineau Brass, a locally based brass quintet, and the enthusiastic audience made full use of a welcome drink, 'fish and chip supper', bar and some fantastic raffle prizes. Thanks for having us, and hopefully see you all again soon. be there on the night. Thank you, Christchurch, we look forward to seeing you again soon. In a welcome return to the homeland – just – the choir received a rapturous reception at St Mary the Virgin in May, in the church originally dating back to the 12th century. The event itself was in aid of the North Weir Trust (www.nwtrust.org.uk) which "provides financial assistance to people living in the local area wishing to undertake projects at home or abroad", and also recognised the significant contribution of Betty Weir, one of the Trust's founders, who sadly died at the end of last year. Thanks so much for such a fantastic night! To coincide with Wales' successful trip to Italy for the start of the Six Nations 2017, the choir embarked on their first tour of the year to Frascati, on the outskirts of Rome. 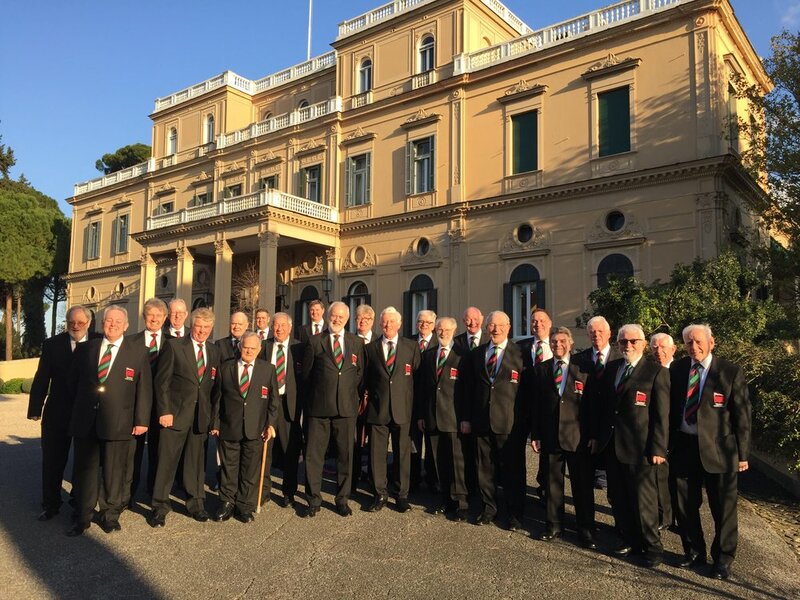 We were honoured to sing to a near sell-out audience at Frascati Cathedral, and then again as guests of the Italian Rugby Union at the 72,000-capacity Stadio Olimpico ahead of the Wales game on the Saturday. 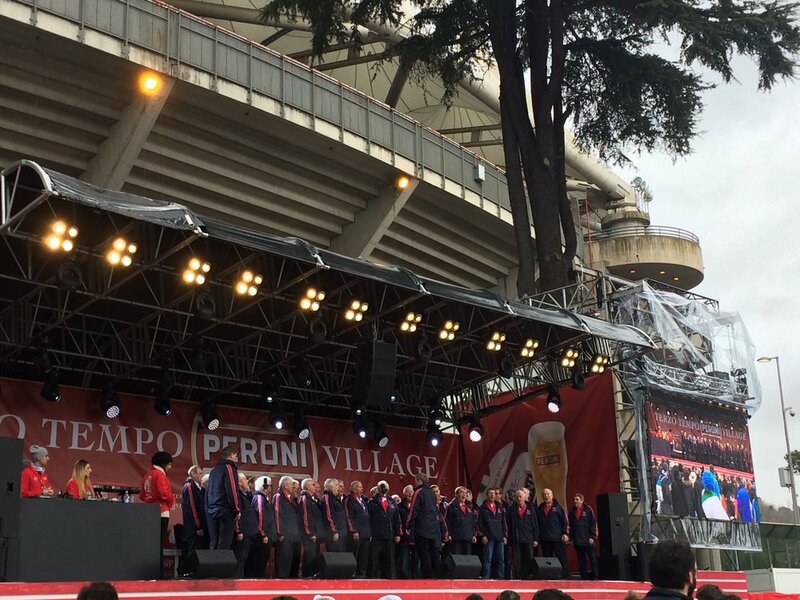 The pre-game performance in the Supporters Village was particularly memorable, lightening the mood of the hundreds of Welsh and Italian fans who were all in friendly mood! We were delighted to be approached by the charity Health Poverty Action to be part of their Christmas fundraising efforts, and we were at Waterloo East station just before Christmas trying to raise spirits – and money! Health Poverty Action do incredible work to strengthen poor and marginalised people in their struggle for health, and we were proud to play a very small part in that and raise a few hundred quid. Thanks to everyone who came along on the night to support us and thanks to the commuters of London for their generosity. Signifying for many the start of Christmas, this awe-inspiring event is now a firm fixture on the choir's calendar, and we were privileged to have been asked to support it once more. Organised by the Ronald McDonald House Charities and held at the fabulous St Martin-in-the-Fields church in Trafalgar Square, the evening combined readings and carols with festive performances from the likes of the chorus of the ENO, all in aid of one of the most important charities supporting the families of sick children in London. Simply beautiful. "If I could bottle the enthusiasm and atmosphere at this concert I would take it everywhere we go." So said our compere Geraint Hopkins at this hugely enjoyable concert on a Sunday afternoon for the Friends of Holy Trinity Church. Sold out, and with a standing ovation, we can only hope that the audience enjoyed themselves half as much as the choir, as we ran through a rep that revived old favourites and introduced new pieces to great rapture. Thank you, Cuckfield, for making it such a special occasion. Having been told that the organisers "never invite acts back for a second year".... we were invited back for a second year!! We were so pleased to be able to support the wonderful Bedford Park Festival in Chiswick, West London last summer, and we were thrilled to be asked to appear again in the beautiful St Michael's and All Angels Church in 2016. Bringing a new, expanded repertoire to the event, some of which was being performed for the first time, we were once again delighted with the reaction of a sell out audience. A massive, winner-takes-all game for Wales vs England at Twickenham? We've been there before, but this time the result didn't go our way. The choir was back at "home" in the renowned Pagoda Room at Old Deer Park once again to get the weekend off to a flyer, hosted by Lions and Wales legend John Taylor, to entertain rugby fans in anticipation of the main course the next day. It was a crackling night, and we even made a special live appearance on the Rhod Gilbert show on BBC Radio Wales the next day. Following the sensational success of the World Cup dinner attended by the entire Welsh World Cup Squad last year, Old Deer Park once again played host to some of our country's biggest rugby stars. Current Six Nations stars Jamie Roberts, George North, Jonathan Davies and Ken Owens, coach Shaun Edwards and former captain Ryan Jones were guests at a special hospitality lunch at London Welsh at the Championship game versus Rotherham, and we were delighted to join them on the day to celebrate (a slightly belated) St David's Day. Chestertons sponsor all the amateur sides at London Welsh RFC, including men's and women's teams, youth team and the club's rugby, and we were delighted to attend the Chestertons Annual Reception. Held at the stunning Royal Academy of Arts, Burlington House in London's Piccadilly, we were on hand to entertain more than 600 of the estate agents' clients, friends and community partners. We were thrilled to have been invited back to the annual carol service in aid of Ronald McDonald House Guy's and St Thomas, a truly wonderful cause. This stunning event, held in the beautiful surroundings of St Martin in the Fields, Trafalgar Square, is for many the start (proper) of Christmas, and we were proud to play a small part alongside stellar names such as the chorus of the ENO and international clarinettist Emma Johnson, and other regulars such as the choir of Sydenham High School and The Evelina Pride Group. Ahead of what could have been a momentous semi-final between Wales and New Zealand in the Rugby World Cup, London Welsh RFC played host to more than hundred All Blacks supporters. In the event Wales had already fallen bravely at the quarter final stage, but the night at Old Deer Park was still a rousing occasion, reviving old friendships made on the choir's previous trip to the Land of the Long White Cloud in 2005. Welsh favourites were combined with kiwi specials for another superb Rugby World Cup 2015 occasion. In the midst of their heroic Rugby World Cup campaign, the Wales squad took time out of their preparations to attend a unique event at London Welsh RFC, Old Deer Park. The choir was thrilled to have been asked to entertain a sell-out audience, alongside such stellar names from the world of rugby as the current captain and coach, Sam Warburton and Warren Gatland, as well as Phil Bennett and Jonathan Davies, and on the same bill as legends from the world of comedy such as Rob Brydon. What a weekend to remember – for those that can actually remember it! Ahead of Wales' momentous win over England, more than 1,500 people were part of a unique atmosphere at Old Deer Park in the build up. It was an emotion-charged event in front of a passionate audience in the marquee, on a bill that included past Wales captains such as Gareth Thomas, Ieuan Evans and Jonathan Davies. In the inaugural fixture between these two sides of "legends", a Colin Charvis-led Wales team set the tone for the Anglo-Welsh weekend with a strong performance over the old rivals. The choir (including, for one night only, Scott Quninell) was proud to have been asked to perform both anthems prior to kick off, in front of large crowd at the Twickenham Stoop and to a wider audience watching live on Sky TV. After its sabbatical in Oxford, London Welsh RFC made its (almost) triumphant return to its spiritual home, Old Deer Park. We were well-received at a packed hospitality lunch for assorted friends and dignitaries from both London Welsh and Bristol Rugby, and although the result didn't go our way on the pitch a thirty minute "set" on the steps of the famous clubhouse after the game went down well with a crowd well into the hundreds. We look forward to many more trips to Old Deer Park in the weeks and months to come. 's-Hertogenbosch by the 53rd Welsh Division. We layed wreaths at the memorial monument (honouring the lives of the 153 Welsh servicemen who died and hundreds more who were injured), before joining a local choir to sing at the Liberation concert at the town's Jheronimus Bosch Art Centre. The original raison d'être for the choir, we formed in 2003 to prepare for the 2005 British and Irish Lions tour of New Zealand. Though the Lions were somewhat dismal on the pitch, the choir nevertheless trod new ground and made new friends, performing to sell out concert audiences in Christchurch, Wellington and Auckland and at various rugby clubs and other venues (including the Top of the Pops New Zealand studios) up and down both the north and south islands. We're very much looking forward to a return trip in 2017. The Dylan Thomas in Fitzrovia event celebrated the centenary of the life, work and riotous pleasures of one of Wales's favourite sons, Dylan Thomas. "The choir's generosity in providing a superb concert," wrote the festival director, "provided the perfect springboard for the week-long London celebrations and provided enormous pleasure to a large number of people." As guests of Grenoble RFC we were thrilled to be able to develop the relationship that had been established during an initial trip in support of London Welsh RFC in the European Cup. Our trip included performing to VIPs and fans at the Top 14 game between Grenoble and one of their fiercest rivals, as well as a series of concerts in small venues in the area. The hospitality we received will live long in the memory. As the focal point of its European tour, we were superbly hosted and received by the people of Seytroux, a small village nestling in the shadow of the Alps in the Haute-Savoie region of France. Amid some stunning scenery, and led by some inspirational compering by one our bi-lingual bases, we delivered a recently expanded repertoire to some appreciative audiences in both indoor and outdoor venues. As a London-based Welsh choir with strong rugby links we were delighted to have been asked by ex Wales and Lions captain Ryan Jones to help celebrate his benefit year with a gala dinner at a top London hotel. A superb night was hosted by Martin Bayfield and attended by a host of stars from the world of rugby and beyond, and we were able to run through our favoured rep of traditional Welsh songs.